We are participating in the year long virtual book club for kids. Though we read the virtual book club book for last two months, we missed to post. November month's featured author is Tomie dePaola. Tomie dePaola has written and/or illustrated nearly 250 books. We own a copy of the book "The Legend of the Indian Paintbrush" and since it's one of our favorite book, we decided to go with the book. 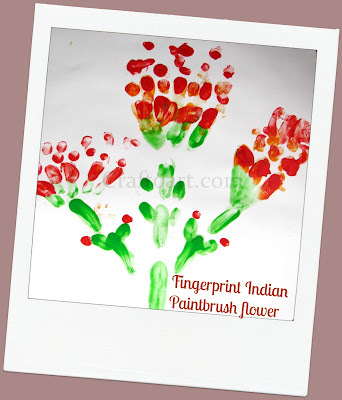 The book tells how the Indian paintbrush flower received its name in an old Indian Legend. It's a story of little Gopher, one who bought the Sunset to the earth. Little Gopher lived on the plains in a circle of tepees and was different from the other boys in the tribe. In spite of all his effort, He couldn't keep up with them who were always riding, running, shooting their bows and wrestling to prove their strength. His parents were worried, the wise Shaman tells that he possess a special talent and he will be remembered for that. One day he gets his Dream-vision to paint the colors of sunset. He tries hard and brings out his Artistic skills by drawing pictures of the warrior and makes different painting of the sunset but he is unable to make the perfect colors of the sunset. Finally one day as a reward to his artistic effort, he hears a voice that asks him to go to the hillside in the evening where he watches the sunset, and on the ground he will find what he needs. He does as directed and finds paintbrushes with the colors of sunset. At last he paints the sunset and leaves the paintbrushes on the hill. The next day, the paintbrushes on the hill bloom into plants with flowers of brilliant reds, orange and yellow. People no longer called him Little gopher but the person who bought the sunset to earth. It is a beautiful story with beautiful illustrations. First we planted bunch of paint brushes on a foam packaging material just like the story(Little Gopher uses them to paint sunset) and used the paint brushes to paint the sunset and the blooms of Indian paintbrush. Thank you Craftprojectideas.com for the pack of paint brushes! Craft project ideas is a website full of kids' arts and crafts projects for preschool Children to Tweens. Products featured on the site are all sold at the Kids’ Crafts aisle in Walmart stores. We got out a poster sheet and I was interested in painting too. So we cut the chart in half and both of us started painting the sunset in our own way. For the sunset, we painted the first layer after green as yellow, the next layer orange and the last layer as red. After painting the evening sky, we painted the Indian paintbrush blooms. We just tipped the brush in paint and made impressions of the brush. I loved painting with CJ, we had great time painting together. The below painting was my art until Cj came in and said "Mommy can I paint yours too"
and we made a combined art! Do stop by the other participating blogs to check out the Tomie dePaola book they have read and the activities! Do you have a post about a Tomie dePaola book, Feel free to link below or come and share your post on the Virtual Book club Facebook page! What a lovely painting! We had never read this book before, but it was the book we chose too! 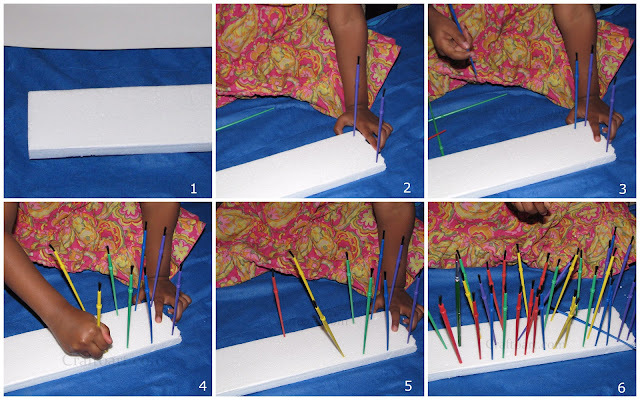 I enjoyed this post and the step by step painting process photos. Thank you. Oh I like the idea of paint brushes in styrofoam. What a great idea. We tried painting with flowers and that did not work well. What a pretty art project to go along with this book!